Today we have had another blast from the media on the theme of Labour 'antisemitism' and a contribution at the Jewish Labour Movement [JLM] Conference from Gordon Brown calling on Labour to adopt the IHRA and remove the 'stain' of antisemitism from the Party. This is the same Gordon Brown who proclaimed that his programme was British Jobs for British Workers, the same slogan as that of the British National Party. Gordon Brown defends 'British jobs for British worker' phrase. In today's Sunday Times the Blessed Margaret Hodge is quoted as saying that Labour is 'consumed by a hatred of Jews.'. The answer to this hatred was to 'engage with Israel.' At least there is no pretence any longer that the campaign over anti-semitism is really about Israel. It's a funny form of racism though to which the solution is to engage with the only Apartheid state in the world. Hodge was also at the JLM Conference. The JLM is the British branch of the Israeli Labour Party, the original party of the Nakba, the expulsion of the Palestinian refugees. The ILP, which is Likud-lite has given its fulsome support for Netanyahu's attempt to expel Israel's 40,000 Black refugees for the crime of being Black and not being Jewish. 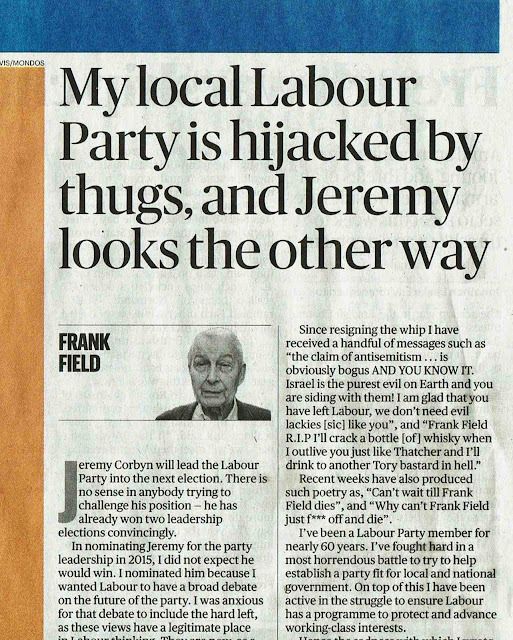 It is a thoroughly racist party but this is where the critics of 'antisemitism' choose to make their feelings known. One of the most remarkable aspects of the controversy about the International Holocaust Remembrance Alliance Definition of Anti-Semitism is that its defenders cannot defend it other than on grounds of expediency. For example Adam Langleben, Campaigns Officer of the Jewish Labour Movement, doesn’t argue for the IHRA on its merits but because it will ‘rebuild trust’ with the Jewish community. [Jewish Labour Movement: There is no trust left] Zionist arguments for the IHRA are little more than emotional blackmail. ‘Do what we say or the Jewish community will have no confidence in the Labour Party.’ Even were this true then it would be irrelevant. Pandering to the fictional notion of a monolithic Jewish community is no argument for adopting a definition of anti-Semitism which would have deleterious consequences for free speech. Exactly the same arguments used against Corbyn were also used against Ed Milband, the Party’s first Jewish leader. In October 2014 we were told that Maureen Lipman was dropping her ‘longstanding support for the Labour Party’ because Miliband had recognised a Palestinian state. Over three years later Lipman was once again leaving Labour, claiming that Corbyn had made her a Tory! The Times of Israel claimed in August 2014 that Miliband had a very Jewish problem. 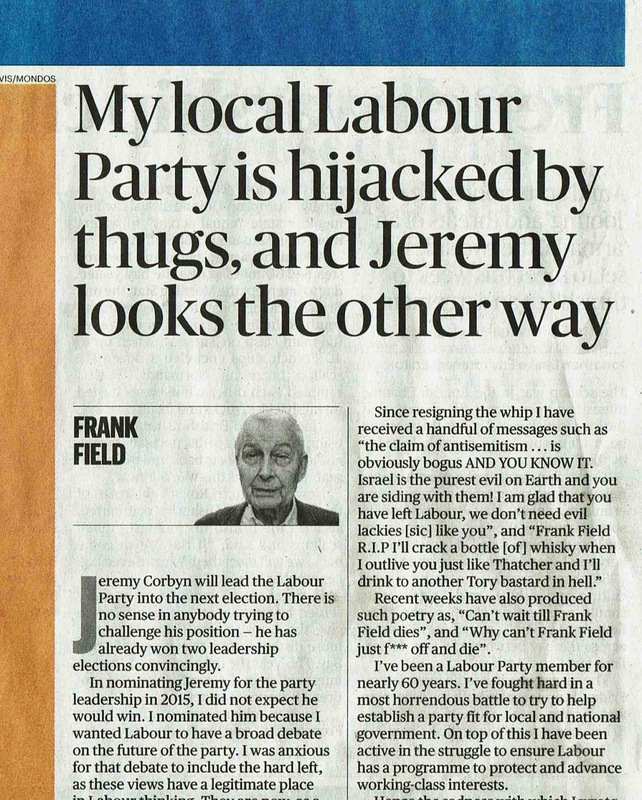 A few months later The Telegraph was telling us that Labour’s first Jewish leader is losing the Jewish vote. So we have been here before. In fact the Jewish community deserted Labour long before either Miliband or Corbyn became leaders. One of the most dishonest advocates for the idea that Labour is anti-Semitic is Jonathan Freedland, gatekeeper at The Guardian. I say dishonest because he deliberately misinterprets what the IHRA says. Dual loyalty is integral to Zionism, hence why anti-Zionist Jews are regularly accused of being ‘traitors’. Our opposition to the IHRA has nothing to do with support for dual loyalty. Freedland claimed that you can say anything about the State of Israel All it prohibits is branding as a racist endeavour “a state of Israel” Again this is dishonest. It is clear that the reference in the IHRA is to the existing State of Israel. This is confirmed by the succeeding example, ‘Applying double standards by requiring of it a behavior not expected or demanded of any other democratic nation’. Clearly this refers to the actual existing Israeli state not some abstract version. It is also clear from this last example that criticism of Israel is indeed circumscribed because Israel is unlike any other nation. It is an ethno-nationalist state in which Arabs are denied equal rights based on their ethnicity. That is the very antithesis of democracy. Freedland is also guilty of caricaturing his opponents. No one is defending the right to say that Jews collectively are Nazis (although undoubtedly there are plenty of Zionist Nazis). The IHRA defines as anti-Semitic ‘Drawing comparisons of contemporary Israeli policy to that of the Nazis’ so the IHRA forbids a comparison between Israeli or Zionist policies with the Nazi state. Clearly Freedland is in need of a visit to Specsavers. That is why there is a necessity to examine the IHRA definition of anti-Semitism to see why it has been criticised by virtually all academics and legal professionals who have commented on it. The actual definition itself is 38 words (minus 11 illustrations). Sir Stephen Sedley, who sat in the Court of Appeal is also Jewish. In Defining Anti-Semitism he wrote that the IHRA ‘fails the first test of any definition: it is indefinite.’ In what is the most concise critique of the IHRA, Sedley took it apart. 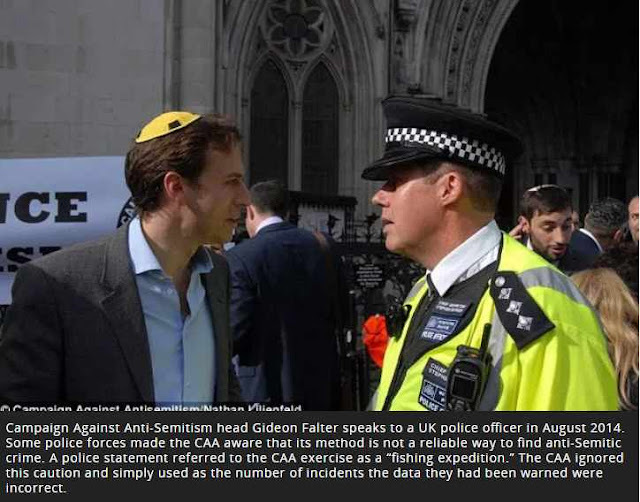 a potential chilling effect on public bodies which, in the absence of definitional clarity, may seek to sanction or prohibit any conduct which has been labelled by third parties as antisemitic without applying any clear criterion of assessment. likely to chill criticism of action by the Government of Israel and advocacy of sanctions as a means to deter human rights abuses in Gaza and elsewhere. Interestingly he finds that when it comes to genuine anti-Semitism, the IHRA is actually very weak. By pivoting upon racial hatred ... it fails to catch those who exhibit hostility and prejudice – or apply discrimination – against Jewish people for no reason other than that they are Jewish. 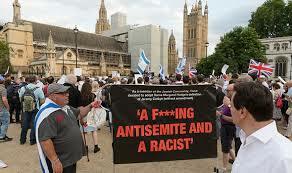 The Oxford English Dictionary definition of anti-Semitism: ‘Hostility to or prejudice against Jews’ catches attitudes that fall short of hatred. So someone who says that he doesn’t hate Jews but he doesn’t want to live in close proximity to them or have his daughter marry a Jew is not, by the IHRA definition, anti-Semitic. Robertson also conducted an analysis of all 11 illustrations of the IHRA. The IHRA consists of an introductory paragraph, the actual definition itself in bold and boxed and then the eleven illustrations preceded by an introduction which states that ‘Manifestations might include the targeting of the state of Israel, conceived as a Jewish collectivity.’ Not only is this assertion tendentious but it could equally be said that manifestations of anti-Semitism include support for the State of Israel! Most anti-semites today support the State of Israel. Anti-Semites such as the neo-Nazi founder of the alt-Right Richard Spencer, who declared that he was a White Zionist, hide their anti-Semitism behind support for Israel. 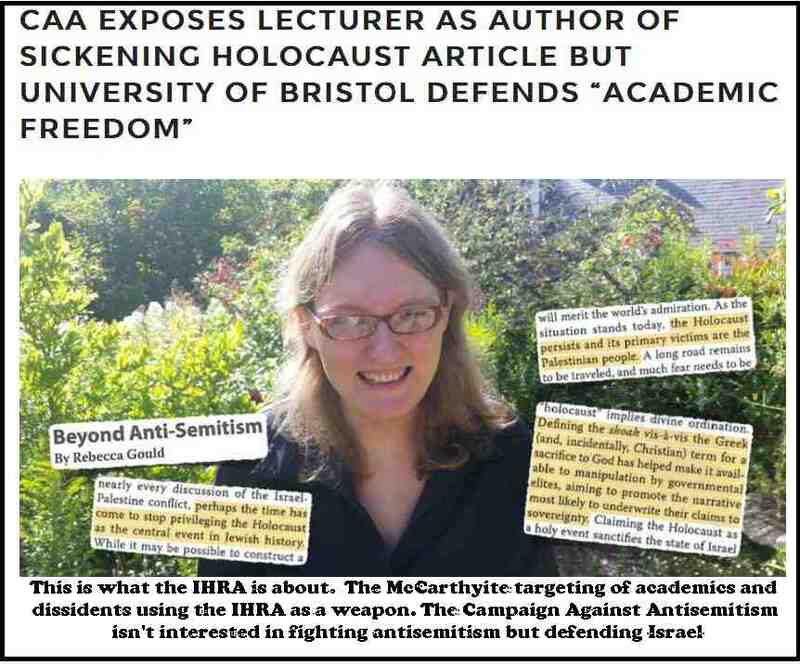 Stern gives as an example of such misuse the way the Campaign Against Anti-Semitism targeted a Bristol University lecturer Rebecca Gould. The CAA boasted that they had written to the University of Bristol demanding that Ms Gould be suspended. Here we can see how the IHRA is a threat to academic discourse. The CAA is a charity that is currently engaged in a campaign to oust Jeremy Corbyn. Compare what Ms Gould wrote to what Edith Zertal, an Israeli Professor of Political Science and History, wrote in her book Israel’s Holocaust and the Politics of Nationhood. Zertal went on to state that there hasn’t been a war ‘that has not been perceived, defined, and conceptualized in terms of the Holocaust.’ Israel has mobilised the Holocaust ‘in the service of Israeli politics.’ Clearly according to the CAA both Zertal and Gould are anti-Semitic. However the IHRA lends itself to just the kind of distortion that the CAA employs because none of these examples was intended to be used as a definition of anti-Semitism but as an aid to data collection. Any definition that requires 11 illustrations to illustrate it is not much of a definition. The whole purpose of a definition is that it stands alone. Because the IHRA definition defines anti-Semitism in terms of ‘hatred’ then its 11 examples must also be evidence of hatred. Example 1: Calling for, aiding, or justifying the killing or harming of Jews in the name of a radical ideology or an extremist view of religion. Obviously calling for the killing or harming of Jews is anti-Semitic, but why does it need to be ‘in the name of a radical ideology or an extremist view of religion’? Would it be acceptable if the ideology was a conservative or socialist one? This suggests that Islam is the real target. Example 2: Making mendacious, dehumanizing, demonizing, or stereotypical allegations about Jews as such or the power of Jews as collective — such as, especially but not exclusively, the myth about a world Jewish conspiracy or of Jews controlling the media, economy, government or other societal institutions. In itself there is nothing exceptional about this other than the fact that the reference to ‘Jews as collective’ elsewhere in the definition refers to the Israeli state itself. As Geoffrey Robertson notes, AIPAC, the Board of Deputies and similar Zionist groups define themselves as Jewish. These bodies not only exercise power but they boast of so doing. AIPAC is always talking up its achievements and boasting of how influential it is. Example 3: Accusing Jews as a people of being responsible for real or imagined wrongdoing committed by a single Jewish person or group, or even for acts committed by non-Jews. Again, as Geoffrey Robertson says, this is unexceptional but the OED definition more than adequately covers instances of scapegoating. Example 4: Denying the fact, scope, mechanisms (e.g. gas chambers) or intentionality of the genocide of the Jewish people at the hands of National Socialist Germany and its supporters and accomplices during World War II (the Holocaust). 30 years ago, when the National Front’s Richard Harwood (Verall) wrote Did 6 Million Really Die then there was no doubt that holocaust denial was a neo-Nazi phenomenon. That isn’t true today. Large numbers of people in the third world doubt the Holocaust. In 2014 a survey of 53,000 people world-wide found that only 8% of people in the Middle East or North Africa believed that descriptions of the Holocaust were accurate and the corresponding figure in sub-Saharan Africa is 12% and and 23 percent in Asia. Just over half of Middle Easterners and a third of Asians and Africans think the numbers of dead have been exaggerated. Is this an example of hatred of Jews? There is no evidence to believe this. Doubt about the Holocaust is directly related to Israel’s use of the Holocaust for propaganda purposes. Because Israel uses the Holocaust to justify its existence as a racist state many people deny it. That was the position of Iran’s President Ahmedinajad. It is a form of instrumentalism. Hindus are the religious group most like to believe that the numbers who died in the Holocaust have been exaggerated. So today we have large numbers of people who are conspiracy theorists or just plain ignorant who deny the Holocaust. For that achievement we have the Israeli state propagandists and Zionism to blame. Example 5: Accusing the Jews as a people, or Israel as a state, of inventing or exaggerating the Holocaust. This is essentially a repetition of the previous example and it is framed to include Israel and the ‘Jewish people’ thus accepting that Jews constitute one people. I’ve never heard Israel as a state being accused of exaggerating the Holocaust. Another attempt to insert Israel into a definition supposedly about antisemitism. Example 6: Accusing Jewish citizens of being more loyal to Israel, or to the alleged priorities of Jews worldwide, than to the interests of their own nations. This could be called the ‘chutzpah’ example. It is Zionism which states that Israel is the nation state of the Jews. If Jewish people are all nationals of the Israeli state then that means they owe it loyalty. It is Zionism that is guilty of accusing Jews of dual loyalty. That is why anti-Zionist Jews are accused of being ‘traitors.’ It is also why the Israeli state surveyed American Jews to find out what they would do if there was a crisis in relations between the two states. Example 7: Denying the Jewish people their right to self-determination, e.g., by claiming that the existence of a State of Israel is a racist endeavor. This is an example of just how sloppy the IHRA is. There is no correspondence between Jewish ‘self-determination’ and claiming Israel is a racist endeavour. It is a non-sequitur. It is perfectly possible to support Jewish national self-determination and at the same time believe that Israel is a racist state. Historically the idea that Jews are one nation, wherever they live, thus implying that British Jews are not really British, was seen as an anti-Semitic idea and that is why Zionism was a distinct minority of Jews before World War 2. What the Zionists were saying echoed that which the anti-Semites said. As Geoffrey Robertson says, the IHRA ‘brands’ as anti-Semitic what is a political opinion. Example 8: Applying double standards by requiring of it a behavior not expected or demanded of any other democratic nation. It is difficult to know how this is an example of hatred of Jews. Apologists for Apartheid South Africa used to ask why we were operating double standards. Why not criticize other Black African states, they said and the answer is the same. States that discriminate on the basis of race and unalterable characteristics are in a class of their own. The IHRA assumes that people are guilty of ‘double standards’ if they single out Israel. Another instance of this definition’s sloppiness is that it talks of a democratic nation, which is a racist concept as it implies that some nations are not democratic. It is in essence a form of special pleading dressed up as anti-Semitism. Example 9: Using the symbols and images associated with classic antisemitism (e.g., claims of Jews killing Jesus or blood libel) to characterize Israel or Israelis. If one accuses Jews of killing Jesus it is anti-Semitic. But this example brings Israel and Israelis into the equation thus making clear that the purpose of this definition is defence of Israel not Jews. Example 10: Drawing comparisons of contemporary Israeli policy to that of the Nazis. Netanyahu has just compared Iran’s Ayatollah Khameini to Hitler. As Israel’s Ynet noted ‘Prime Minister Benjamin Netanyahu compared Sunday the Iranian regime to Nazi Germany.’ Margaret Hodge also compared the threat of disciplinary proceedings to that of refugees fleeing from Nazi Germany. Because Israel claims that the Holocaust is what gives it its moral foundations then it is appropriate to see whether Israel is living up to that claim. Regardless there is no reason to believe that people make such a comparison do so because they hate Jews, which is the core of the IHRA. Example 11: Holding Jews collectively responsible for actions of the state of Israel. I agree that holding Jews collectively responsible for Israel’s actions is anti-Semitic but it is the Zionist organisations such as the Board of Deputies who claim that British Jews support Israel’s actions in Gaza and the West Bank. The Board of Deputies organized demonstrations to support Operation Protective Edge in 2014. Israel calls itself the nation state of Jews, all Jews. Presumably then British Zionist organisations are anti-Semitic! It is therefore understandable that the Board of Deputies and Zionist Federation don’t want a debate to open up on the IHRA. Instead they want the IHRA to be adopted without debate because they know that is intellectually and politically unsustainable.